SEPTEMBER 2016 VOICE: Throughout the ages, philosophers have cautioned not to allow perfection to become the enemy of the good. In other words, inaction is often the worse option. Such is the place where proponents of reforming the Social Security Windfall Elimination Provision (WEP) law now find ourselves. Our Association is part of a national coalition working to reform both the WEP and Government Pension Offset (GPO) laws. SEPTEMBER 2016 VOICE: In the final hours of the formal legislative session for 2016, the House and Senate voted to override Governor Baker’s veto of Section 45 of the FY17 State Budget. Section 45 extends the municipal retiree health insurance premium moratorium by two years, until July 1, 2018. Had the veto not been overridden, some municipalities were poised to immediately increase insurance contribution percentage rates for retirees. 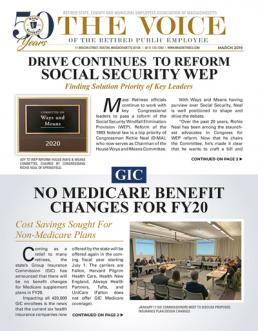 SEPTEMBER 2016 VOICE: A week in July that began with the promise of legislation reforming the Social Security Windfall Elimination Provision (WEP) advancing in Congress, has instead ended with the bill suffering a setback. Association officials spent significant time in Washington, DC, working side-by-side with coalition partners from Texas in an effort to advance WEP reform through Congress this year. COLA News: Leominster at it Again! SEPTEMBER 2016 VOICE: Despite pleas from the Leominster Retirement Board elected members John Perry and William “Tex” Thibodeau, the Mayor’s Board appointment, David LaPlante and his appointed City Comptroller John Richard voted “No” on granting a $360 annual “COLA” increase for this year. This will be the seventh consecutive denial dating back to June, 2010 that both of these members have voted “No”. SEPTEMBER 2016 VOICE: With next year being the 20th year of local COLAs being granted by the regional and municipal board of trustees, all of the state’s 103 local retirement boards, with Leominster being the one regrettable exception, voted for their new pension cost-of-living (COLA) effective this July. The Governor and the Legislature approved the 3% State and Teachers’ COLAs on the $13,000 base. How Much Are Retirees Paying For Health Care?